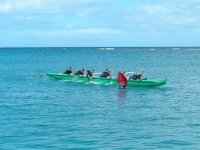 Outrigger canoe racing is embedded in the culture of Hawaii, and each year the race, considered to be the world championship, attracts thousands of fans. The canoes form a large part of the way of life of the islanders and in the past the prestige allocated upon those who would win the race was enormous. Nowadays, although the symbolic nature of the victory remains, the festival enjoys a relative influx of tourist interest and media attention.